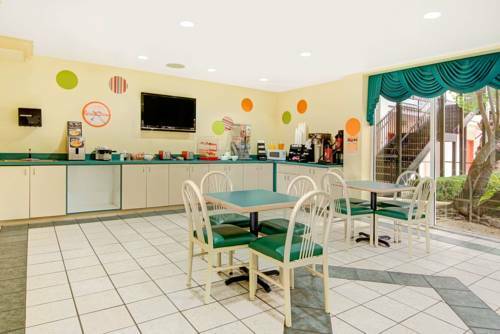 Take the family on a fun-filled vacation to this Howard Johnson Inn and Suites Central San Antonio conveniently located off Interstate 10 just 15 minutes from San Antonio International Airport. Ride the towering roller coasters at Six Flags Fiesta Texas, or make a splash at Six Flags Water Bay Water Park 10 miles away. Visit the dolphins and penguins at Sea World San Antonio, or stroll the scenic San Antonio Riverwalk for entertainment and dining. Start your morning energized with a complimentary Rise and Dine continental breakfast before breaking a sweat in the fitness center or swimming in the outdoor pool. Relax in the hot tub or walk around our scenic courtyard. Enjoy the complimentary daily newspaper, complimentary parking and guest laundry facilities. Connect to complimentary wireless Internet access from the comfort of your guest suite with microwave and refrigerator, or request a hot tub, smoke-free or handicapped-accessible suite.